For centuries, Azerbaijan’s cultural heritage has accurately represented this nation’s great past, unique culture, and its origin. BP has been closely involved with Azerbaijan’s rich cultural legacy since the early days of its presence here. To date, we have initiated and implemented numerous successful projects in support of the development of Azerbaijan’s culture, as well as the promotion of its amazing cultural legacy. One of the first projects in this series was the Children’s Mugham Festival – the competition of young mugham performers that BP launched in 1997. As a matter of fact, it was the largest children’s event ever to take place in Azerbaijan since its independence in 1991. Hundreds of mugham and folk music performers, under the age of 16, gathered from all parts of Azerbaijan for the competition. Most of the talented children were from displaced families from Nagorno-Karabakh, the cradle of this very special music, where so many of Azerbaijan’s great composers and musicians were born. Today, the territory of Nagorno-Karabakh remains under occupation by Armenian forces, placing mugham in danger of disappearing. With this project, we encouraged the rebirth of an important piece of Azerbaijani national culture and helped the children of Nagorno-Karabakh maintain their identity under very difficult conditions. The project that we supported for three consecutive years was of great success. The quality of talent in such young and terribly deprived children was astonishing. The enthusiasm of their teachers, grandmasters, and national musical experts, who have done so much to develop this talent, was inspiring. The sense that our contribution, as a good corporate citizen, was so critical to this achievement, was heart-warming. As the standard of entries was very high, the judges, who included mugham grandmasters and national music experts, had a difficult time in making their decisions. In partnership with the Ministry of Culture of Azerbaijan, BP has accomplished quite a few projects which have left a footprint in the new history of Azerbaijan. This partnership has built a remarkable track record of supporting important research works, publications, and producing documentaries over the past 26 years of BP’s presence in Azerbaijan. These are mainly the projects that aim to pass the country’s valuable heritage to future generations. We believe that by supporting these initiatives we are contributing to increasing local and international recognition of Azerbaijan’s cultural heritage. 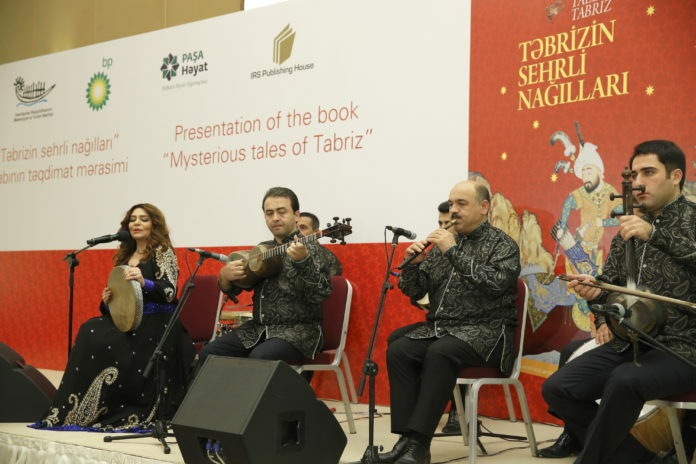 The book, “Mysterious Tales of Tabriz,” traces the basic stages of the evolution of Medieval Azerbaijani miniature painting and its impact on other schools, is a great example of cooperation in communicating Azerbaijan’s legacy to the world. The art of miniatures is one of the brightest phenomena in the world of figurative art, which was widely spread in this region in the Middle Ages. Azerbaijani miniaturists’ contribution to this amazingly beautiful art is immeasurable. It is recognized that the legacy left behind by the Tabriz masters is colossal and their contribution to world culture is tremendous. Today, the works of Azerbaijani artists are available in famous museums around the world including the Metropolitan Museum of Art in New York, the Freer Gallery of Art in Washington, D.C., the Topkapı Palace Museum in Istanbul, the Chester Beatty Library in Dublin, the Golestan Palace in Tehran, the British Museum, the British Library, the Edinburgh University Library, the National Library of Russia, as well as the Louvre Museum and the National Library of France in Paris. A wide collection of precious miniatures created by Tabriz masters remain inaccessible to researchers as they are stored in private collections that are closed to the public and scientists. The author of the book, Professor Jamila Hasanzade, has compiled a plethora of well-researched facts and opinions of leading Western and Oriental scholars. The book comprehensively covers the classical period of Azerbaijan miniature painting from its first steps in the 13th century until its blossom during the Safavid period in the 16th century. The other BP sponsored project is a documentary titled “Sarylar – A Journey to the Karabakh Horse.” This film helps contribute to a wider recognition of a unique breed of horses whose home is the Karabakh region of Azerbaijan. It represents BP’s contribution to the protection of Azerbaijan’s vast national heritage and values in cooperation with the Ministry of Culture of Azerbaijan. The film has been produced by an international film production company from Germany in cooperation with Azerbaijanfilm. This joint product, created by an international film crew, introduces the Karabakh horses – one of the last purebred horse breeds in the world. The story is inspired by the search for the descendants of the Karabakh horse “Golden Boy,” presented to the Queen of the United Kingdom in 1956. A long and fascinating journey ends all the way across Europe and the Caucasus Mountains to find the successor Karabakh horse, “Golden Boy II,” in his homeland of Azerbaijan, safe and glorious. The story once again highlights how human beings and animals depend on and can learn from each other. The film also captures Sarylar’s performance of a beautiful Azerbaijani dance at the Windsor Castle in the United Kingdom in 2012 during the Queen’s Diamond Jubilee. BP,in cooperation with the Ministry of Culture, sponsored the production of a documentary film about Vagif Mustafazadeh, a world-renowned Azerbaijani grandmaster jazz piano player and composer. He is the founder of a new genre in the art of music – the jazz-mugham. He created a fantastic combination, which has come out as a brilliant fusing of Azerbaijan’s national music, known as mugham, and Western jazz. The film features episodes of his life, as well as other well-known musicians’ thoughts about this world-renowned jazz performer. The documentary includes many interesting unknown facts related to the creation of Mustafazadeh’s legacy, an interview with the Voice of America’s famous JAZZ HOUR mentor, Willis Conover, and some expressions of the great blues performer B.B. King. This documentary presents Mustafazadeh to the international spectators as a citizen of the universe who belongs to the world’s cultural heritage. Every nation has an ancient written literary monument that reveals the identity, values, and character of the people who live there. The Azerbaijani people can trace their Turkic cultural legacy from “The Book of Dede Gorgud,” a masterpiece from the world’s treasury of epic poems for its humanitarian ideas. Religious tolerance, which was a characteristic of the Oghuz-Turkic mindset, is also reflected in this epic poem. This literary landmark, whose 1,300th anniversary was marked by UNESCO, is a cultural phenomenon which encompasses the past and the present in the history of mankind, myth, and history. A celebration of this anniversary of Dada Gorgud was the biggest cultural event in Azerbaijan’s calendar in 2000 and BP is proud to have made a contribution to this big event. BP sponsored the respected author Professor Elmaddin Alibeyzade’s researched publication on Dada Gorgud. This can also be considered as a contribution to the study and recording of Azerbaijan’s history, which aids in developing the minds of people and improving society. Ismayil Mammadov, Azerbaijan’s leading contemporary artist, who, with his passionate imagination, made very powerful illustrations on Dada Gorgud themes and characters. This was a substantial contribution to the success of the book. The other fundamental publication that BP funded to promote Azerbaijan’s history and culture is a book dedicated to the Azerbaijani philanthropist, Haji Zeynalabdin Taghiyev. He was one of the most famous and respected oil barons, not only in Azerbaijan but also in Russia and all of the Muslim world. Despite the decades of anti-bourgeois Soviet propaganda that followed his lifetime, Taghiyev has always been remembered by the Azerbaijani people for his charitable deeds. He sponsored the construction of the first Azerbaijani national theatre in 1883 and helped to repair it after ultraconservative clergy burned it down in 1909. In 1911, he covered all the expenses for the construction of what would later become the Azerbaijan State Academic Opera and Ballet Theatre. He also built the first secular Muslim school for girls in the Middle East in 1898–1900 and personally obtained the permission for the construction of this school in his correspondence with the Russian Empress Alexandra. Taghiyev also helped to solve the water problem in Baku by funding the Shollar pipeline construction, channelling water 100 miles away in the north from the Caucasus Mountains via a ceramic pipeline. Additionally, he provided scholarships for many Azerbaijani youths, who strived for higher education in prestigious Russian and European universities. These are just a few in his long list of charitable and philanthropic activities. The Azerbaijan Carpet book, an exquisite volume published by BP Amoco, is another example of the promotion of Azerbaijan’s cultural legacy. The 262-page volume features hundreds of colour photographs, showing the centuries-long development of Azerbaijan’s carpets, which play an important role in uncovering this nation’s cultural heritage. The carpets, with various designs, historically representing different regions of Azerbaijan, were called “Caucasian” or “Persian” depending on whether the carpet was woven north or south of the Araz River, which currently divides Azerbaijan and Iran. As a matter of fact, 95 percent of Caucasian labelled carpets, and perhaps up to half of the so-called Persian carpets, are actually Azerbaijani. The map published in every Sotheby’s Auction catalogue, detailing the classic oriental carpet weaving areas, clearly shows Azerbaijan as the name of the area where most of the so-called Caucasian and many of the so-called Persian carpets originated. Throughout Azerbaijan’s ancient and deeply complex history, the culture and notably the love for carpets and making carpet masterpieces has been a source of great national pride. Azerbaijan takes every opportunity to present and extend the love for carpets and their craftsmanship on an international level. The visit of Prince Michael of Kent of the British Royal Family, which took place in February 2004, was one of them. Minister of Culture Abulfas Garayev, on behalf of the government of Azerbaijan, was hosting His Royal Highness’s visit and shared with him the ministerial initiatives in preserving Azerbaijan’s cultural heritage. One of the memorable events during Prince Michael’s visit was the trip to Sangachal terminal, the detailed program of which I prepared. Apart from a business update, we also shared with Prince Michael the information related to archaeological findings during the project affected construction activities. The visit was a complete success and it was evident from Prince Michael himself when he shared his impression through media with extremely positive feedback. Today, Azerbaijan has achieved tremendous successes in building a prosperous nation. It ranks at the top of the world’s most tolerant societies, successfully promotes multicultural values, and its rich cultural heritage is viewed as a model for ethnic and religious tolerance. The cultural heritage of Azerbaijan now enriches the honour list of UNESCO’s world masterpieces. About the author: Guivami Rahimli, Ph.D., joined BP in 1995 as a government relations expert. Since then he has held various managerial positions and currently serves as Senior Government Affairs Advisor for BP Azerbaijan, Georgia, and Turkey regions. He is also an associate professor at the faculty of international relations at Baku State University, lecturing in energy security and multilateral and regional diplomacy.